You have successfully added a product to your shopping cart. No favourites have been added. Masala Chai - Three teas selected for the ultimate chai experience. A Masala Chai Collection - Masala (meaning a blend of spices) chai is the proper term to described spiced tea. Our Masala Chai collection offers three teas selected to give completely different experiences using simple ingredients. A bestseller, made with bold black tea and a heavy dose of spices for a strong, traditional style masala chai. Great alone, with milk, as a latte or prepared like a traditional chai. Black tea, spices and flower petals create a flavour reminiscent of gingerbread. This tea will surely make you swoon! Ingredients: Organic black tea, organic cardamom, organic cloves, organic black pepper, organic rose petals, organic lavender, organic chrysanthemum petals. Perfect for the evenings or for kids! Rooibos Chai is naturally caffeine-free, and contains all off the flavour you would want from a masala chai. Rooibos is woodsy and slightly nutty, adding a unique twist. Ingredients: Organic rooibos, organic cinnamon, organic cardamom, organic cloves. These teas can all be prepared with boiling water. 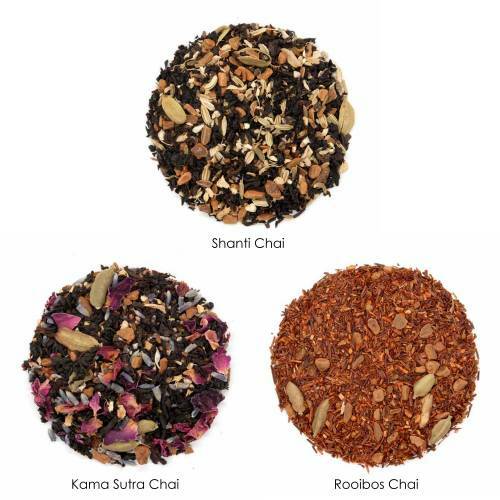 Shanti Chai and Kama Sutra Chai should be infused for 2-3 minutes (up to 5 if using milk), Rooibos Chai can be infused for 5-10 minutes. We recommend trying all three without any added milk or sweetener first, then adjusting to suit your personal preferences. Traditionally, chai is made with 50% water and 50% milk. Boil your water in a pot. Once boiling, add milk, tea and spices. Return to a boil, reduce heat and simmer for 5-10 minutes. Add sweetener to taste if desired. Have you tried A Masala Chai Collection? Tell us what you think! Please login or create an account in order to post a review and rating. If you walk into any Indian family kitchen and ask for the recipe for perfect masala chai, it is guaranteed that you will never get the same answer twice. There is no hard rule for this beverage, but that doesn’t mean there aren’t easy guidelines to follow. First things first, chai means tea. If you say “can I have some chai tea”, you’re essentially saying “can I have some tea tea”. What you likely mean to say is masala chai (as in, tea with a blend of spices). Masala is the Indian term for a mixture of spices. Masala chai was around far before tea made it’s way to India. Some date the history up to 9000 years ago! Before the 1930’s when tea was introduced to the Indian market, masala chai was simply a blend of spices infused for medicinal properties in Ayurveda and did not contain any tea. Read the rest of the article on our blog. Before we dive into the recipe for our new favourite cold weather warm up, check out some of the history behind this classic brew. Toddies came from India, the fermented sap of the toddy plant, named tari in Hindi. The British brought back a version of this brew, and originally it was served cold. Eventually, this brew was served hot as a comforting beverage with the same mix of spirits and spices. The hot toddy was based on a Scottish cold remedy of whisky, hot water, and spices such as nutmeg or clove. Suggestions that the name comes Tod’s Well, a source of spring water outside of Edinburgh. In Dublin, Ireland, Dr. Robert Bently Todd would recommend a brew of hot whisky, lemon and cinnamon. Stay in touch to receive special offers.